WrestleManias these days are more like the Super Bowl than ever before. In the NFL’s biggest annual game, while the outcome determines a champion, thus making the game the most relevant part of the weekend, the lure and aura of the halftime show, commercials, and interminable pre-game shows loaded with puff pieces draw in the casual viewer. In the last year and a half or so, World Wrestling Entertainment has dove into the deep end of social networking. You can’t sit through more than five minutes of Monday Night Raw anymore without Michael Cole prattling on in his cacophonic shriek about “hashtags” and “trending” and whatnot. Wrestlers tweeting threats to each other on off-days, usually in character, have begun to replace traditional story elements of tag team miscues and title shot demands as a means of fueling feuds and grudges. With Twitter and Facebook as prime means of communication, it’s no doubt that WWE would exploit any chance to reach potential viewers. Of course, WWE also continues the time-honored tradition of immersing past stars into the present story world. In recent years, we’ve seen Chris Jericho run afoul of Hall of Famers like Ric Flair and Ricky Steamboat on the Road to WrestleMania. One year later, Vince McMahon and Bret Hart modified their years of bad blood into a three month story arc that culminated in one of WrestleMania’s most unlikely matches. 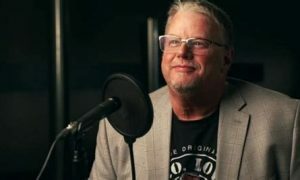 With a Georgia Dome to fill, and fans to get talking, WWE brought somebody in off the bench to help ensure the likelihood of both. It had been nearly seven years since he was last seen…. On February 14, 2011, a day devoted to love, wrestling fans jilted by the loss of WWE’s classic spontaneity and assertiveness were greeted to the sports entertainment equivalent of John Cusack standing below their bedroom window with a boombox. One week after Vince McMahon announced a special guest host for WrestleMania, The Rock showed up in Anaheim, to an ungodly ovation from fans who had missed one of the sport’s greatest heroes. 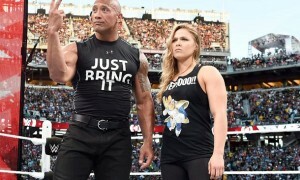 Dwayne Johnson systematically riffed on The Miz and John Cena, the two would-be main eventers, the latter in particular for some scathing public comments. Cena had derided Rock for leaving WWE completely behind in his pursuit of Sunset Boulevard, and now “The People’s Champion” was back to dress down his verbal attacker. Ahh, Michael Cole’s heel turn. That ties into WrestleMania as well, as Cole, now pro-heel to the hilt, kept getting under the skin of Jerry Lawler, his longtime partner. When Lawler attempted to become WWE Champion in his only-ever shot, and felt short vs. The Miz, Cole rubbed it in to Lawler in antagonistic fashion. Emotions spilled over when Cole let slip that Lawler’s now-dead mother watched her son lose, and “The King” finally put his hands on his partner. Soon enough, a match would be signed, with Jack Swagger as Cole’s trainer, and Stone Cold Steve Austin (what did I say about classic acts?) as the guest referee. We haven’t even mentioned the Royal Rumble winner yet. Alberto Del Rio won the only 40-Man Rumble in history, and selected Edge, the World Heavyweight Champion, as the hilltopper he wished to knock off the summit. This feud had the added advantage of involving Christian, whom Del Rio put out of action in the fall of 2010. The reunited brothers (not friends, screw you WWE) banded together against Del Rio, his servant Ricardo Rodriguez, and protégé Brodus Clay. To add more star power, The Undertaker’s streak of eighteen WrestleMania wins would be put on the line. Rumors swirled about who would try to end the mark. First, former UFC Champion Brock Lesnar was considered, but a deal never occurred. Then Sting was to jump from TNA, but re-signed with the company in the eleventh hour. 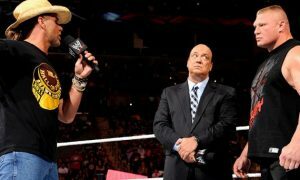 Finally, Triple H stepped in, and engaged in weeks of tremendous dueling promo monologues with The Dead Man. The one from March 28 involving Shawn Michaels was some of WWE’s best TV to date. CM Punk would face Randy Orton in a war over some of Orton’s past acts of aggression. And speaking of aggression, Orton would take out each of Punk’s Nexus flunkies on the road to their showdown. Michael Cole, Jerry Lawler, and Josh Mathews provided commentary, with Jim Ross and Booker T joining in later. Keri Hilson performed America the Beautiful. The Hall of Famers included Shawn Michaels, The Road Warriors, Paul Ellering, Sunny, Hacksaw Jim Duggan, Abdullah the Butcher, Bob Armstrong, and Drew Carey. Rock and Cena would immediately begin to hype their one on one match for a year later, but the fans were still coming to grips with the show that they’d just been fed. Bryan/Sheamus bumped? Edge opening? Rock rambling in horrible segments? Cole wrestling for fifteen minutes? Snoop Dogg hosting a sing-off? No title changes? SNOOKI?!?! Four of the matches (Edge/Alberto, Rey/Cody, Punk/Orton, Taker/HHH) were all WrestleMania worthy, and keep this from being a complete clunker. That said, there were so many head-scratching decisions involved with WrestleMania XXVII, you’d think Vince McMahon was bound and gagged backstage while Vince Russo and Herb Abrams ran amok with the booking sheet. As for the show’s most enduring image, it has to be The Rock. It was supposed to be, theoretically, a night for Cena and Edge, two longtime heroes, to wage war with two upstart villains, Del Rio and Miz, in championship matches, but they were mere appetizers. Rock leading the fans in a chant exhibition, and then cavorting around with Mae Young and Peewee Herman…..this was somehow necessary, according to WWE. Rock standing tall to close the show is the official portrait, and that pretty much sums up the show’s downfall.